This is part of a three-part series of blogs to celebrate the publication of our hundredth book. To read the first part, click here. To read the final part, click here. Most people in the developing world never own a book. Even in developed countries, the prohibitive price of textbooks and academic titles hinders education, eating into shrinking library budgets and also making it less likely that individuals can afford to buy academic books. In developing countries the situation is even more critical: economic factors combine with lack of infrastructure to restrict access to printed textbooks and university-level titles. 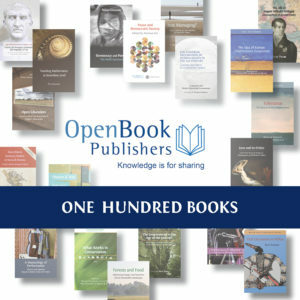 Open Book Publishers was born in 2008, sparked into life by co-founder and managing editor Alessandra Tosi’s first-hand experience of the frustrations of academic publishing. The thrill of seeing her book in print was dampened by the realisation that, thanks to its exorbitant price and small print run, very few people would have the opportunity to read it. She and co-founder Rupert Gatti began OBP to make high-quality academic books accessible for everyone everywhere and free of charge. Nine years on we have come closer to realizing our ideal of a world where scholarly works are available to all. With the publication of our hundredth title, Michael Bryson and Arpi Movsesian’s Love and Its Critics: From the Song of Songs to Shakespeare and Milton’s Eden, it is a good time to ask: what have we achieved as we arrive at this milestone, and what do we want to do next? Over three blog posts we will discuss our innovative publications, our Open Access model and our technological development to celebrate some highlights from our first one hundred books – and to chart a course for the next hundred!